When it came to the Warriors-Clippers series, the prevailing prediction seemed to be that the Clippers hardly had a snowball’s chance in hell of stealing at least one win from Golden State. However, the caveat to that pessimistic prediction was that Los Angeles could at least make things interesting. Both parts of that prediction came true on Saturday night when the Warriors beat the Clippers, 121-104. It shouldn’t come as a major surprise that Patrick Beverley was involved in what made things “interesting” for the series. Regardless of what someone thinks of him, most people would agree that he tends to enjoy getting under the skin of opposing players—particularly those who are easy to bother. This is where Kevin Durant comes in. 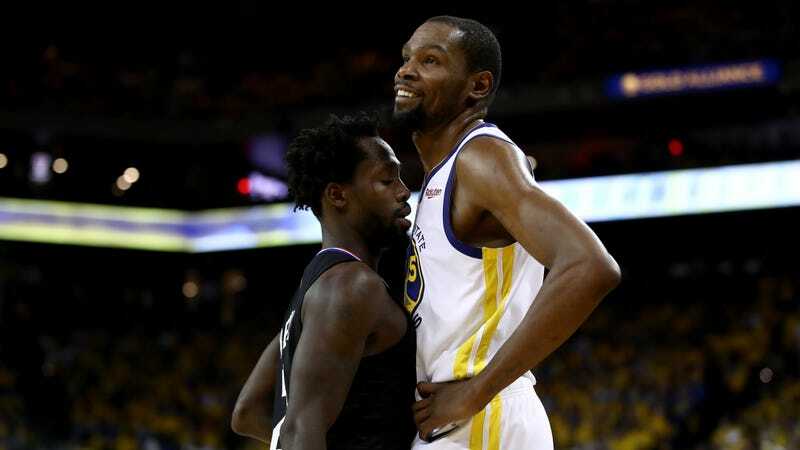 Up until the third quarter, things had been relatively quiet between the two players and the back-and-forth action could be described as “hard-nosed defense.” Then, Beverley was called for a reaching foul on Durant. The Clippers guard believed the only reason that was called was because Durant had flopped, and he made that known by repeatedly miming it in front of Durant. Of course, once that incident happened, it was a good way to cap off a montage of all the ways Beverley had been trying to bother the hell out of Durant throughout the game. It wasn’t until the fourth quarter that things truly boiled over. Beverley was bringing the ball up and was preparing to back down Durant about 10 feet from the three-point line. Given that he’s not exactly the most skilled ball-handler, Beverley lost the dribble and tried to go ofter it. Durant also tried to go after the ball but seemed to also give the Clippers guard a mild shove in the process, which sent the guard into the scorer’s table. The Warrior started yelling at Beverley when he was down, Beverley got up to return some words back and the ref awarded double technicals, which resulted in both players getting ejected. Going forward, it’s clear that neither of these players will have the same amount of leeway for their antics as they did in Game 1. But that officiating leash hasn’t stopped Beverley from becoming the irritant he’s always been known to be. If there’s an opening to get one of the Warriors’ best players so pissed off that it warrants an ejection, he’s always there to set that trap. It’s something that Steve Kerr acknowledged after the game. The Clippers will be lucky to get a game from the Warriors this series. But if the efforts of Beverley do enough to frustrate players who have already been having a, let’s say, less-than-ideal season as a group, then it’s likely that Los Angeles will also consider that a win in its own right.